There need to be more serious squeaks in comics. 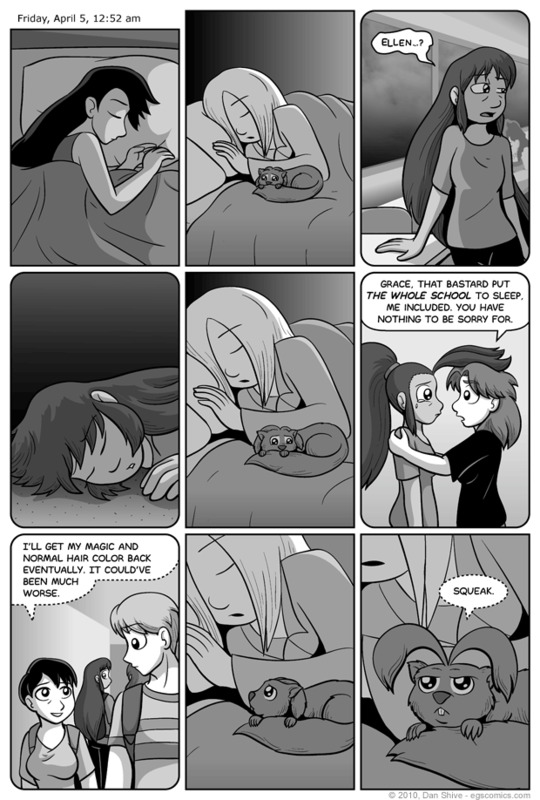 And yeah, there's a lot of copy/paste going on in this comic, though the art has been updated slightly since Sister 2, and I find Susan essentially being in the same sleeping pose amusing. I'm not sure why; it just seems appropriate somehow. There have been moments during this storyline when Grace has seemingly behaved out of character, but I can now state for the record that it wasn't just a result of bad writing! Anyway, Grace's sudden seriousness in this scene should make a bit more sense now. I mentioned towards the end of Sister 2 that the ending was being simplified, and one things that was changed was Grace's falling asleep without ever encountering Abraham. I originally planned on her briefly fighting him, her magic resistance allowing her to stay awake just long enough to be a brief nuisance to Abe before falling asleep. That could have been interesting, but it wouldn't have changed much beyond making the story longer and possibly opening up plot holes. In retrospect, I actually prefer that Grace was just 100% ineffectual against Abe to the point that she didn't even make it out of the classroom. Given the power she has at her disposal, even if she shouldn't feel guilty about not being able to help, I think it's pretty much unavoidable. I would feel bad in her shoes, and Grace is even more prone to feeling guilty than I am, so there's no way she's not feeling bad about it.